In a world plagued by legal manipulation, political corruption, and a general lack of fairness for the underprivileged, there's something comforting about a video game where justice is always served. Sure, everyone lies under oath and one out of every four witnesses is a murderer, but at least the innocents always go free. 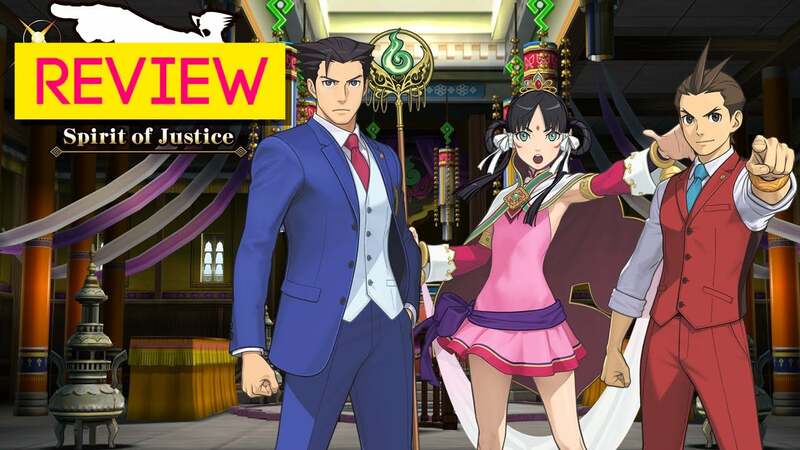 Phoenix Wright: Spirit of Justice, the sixth mainline game in the Ace Attorney series, takes us on yet another trip to a world where the good guys always win. With a combination of convenient evidence, astounding persistence, and savvy lawyering, Phoenix Wright and his ever-expanding team of attorneys have already managed to defend something like 25 clients from false murder charges, and Spirit of Justice brings us even more, both old and new. It's the same rhythm, again and again. Any client Phoenix takes is always innocent. Phoenix always exonerates them. After stories like Making a Murderer and Serial, the idealism of this world is refreshing, no matter how ridiculous the stories might get. Nigglings aside, the Phoenix Wright formula is always a winner. Over the years, the developers at Capcom have streamlined some of the old games' clunkier systems — no more pixel hunting! — and added some essential improvements like optional hints and faster text loading. There's a great rhythm to courtroom battles as they escalate and unravel in dramatic fashion. Spirit of Justice doesn't have a single "AHHHHHH!" moment as great as its predecessor, Dual Destinies, but it does pull off some cool feats, including a late-game adventure sequence that's as thrilling as any great book. A large chunk of Spirit of Justice is set in the fictional nation of Khura'in, where the citizens hate lawyers because of a mysterious incident that happened 23 years before the game. As a result of this, Khura'in's authoritative government has enacted a law that defence attorneys must share culpability for their clients' actions. In other words, if someone is sent to death, their lawyer goes with them. This has scared most lawyers away from Khura'in entirely — except for our boy Phoenix, who knows that things will always work out in his favour. Phoenix is in town to visit his old assistant, Maya, who returns in glorious fashion after a two-game absence. It may not shock you to find out that he has to defend some people from false murder charges along the way, fighting against a Khura'inian prosecutor who likes prayer, insults, and pseudo-Japanese tirades whenever he's feeling frustrated. By setting several cases in Khura'in, the developers had an excuse to add yet another new mechanic to Spirit of Justice: divination seances. The royal princess of Khura'in, an arrogant teenager named Rayfa, has the ability to evoke visions of a murder victim's last moments before death. Except Rayfa's interpretations of those visions are always wrong. You, as Phoenix, have to pick apart each of her insights based on how they contradict with reality. It's a neat system. Figuring out the contradictions can occasionally be frustrating thanks to those good old Phoenix Wright logic leaps, but most of the time it's fun to pick at Rayfa and watch her melt down every time she's proven wrong. I should add: This is a long, challenging game. I saw the game over screen quite a few times as I ventured through Khura'in and Phoenix's home country of Japanamerica. There are five cases. Two are short; three are sprawling and twisty. The middle sections can get a little sluggish, but the final case picks things up in a wild way. As the story unfolds and gets more complicated, Spirit of Justice gets into heavy questions about courage, parenthood, and fairness. The game throws some traumatic obstacles at Apollo and Rayfa — incidentally, the game's two best characters — and it's fascinating to watch how they grow and handle each challenge. By the end of the game it's clear that both of their lives will never be the same. Just before getting a code for Spirit of Justice, it occurred to me that Phoenix Wright is one of those video game series that I'll just never get sick of. There's just something about these games — the logical threads, the ridiculous courtroom antics, the outlandish plot twists — that makes me really happy. 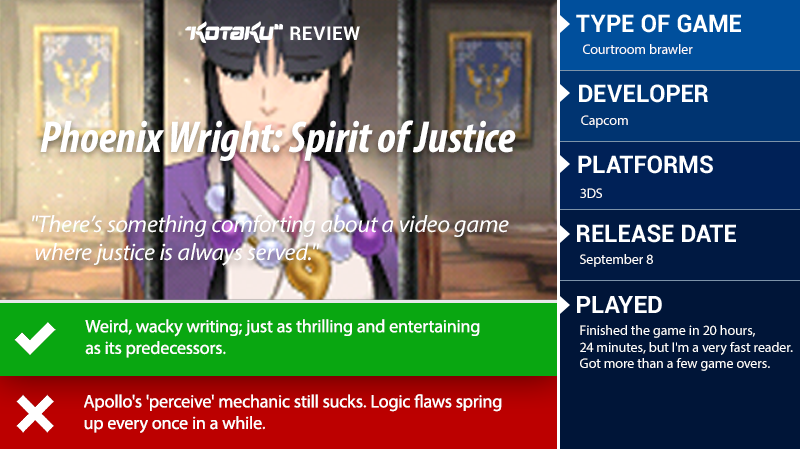 Spirit of Justice is no exception. I hope Capcom never stops making these things. I've never played Phoenix Wright, but the idea of what I assume is a modern democratic nation forcing defense attorneys to share the sentence of their clients is laughable, and not in a good way. I'd have an easier time believing the Mushroom Kingdom exists. If lawyers had to share the fate of their clients no one would become a defense attorney. This means most people would have to represent themselves. Because the law requires detailed, specialised knowledge those people would be completely shafted at their trials. People would lose faith in the justice system, which would cause protests and social unrest. The whole system would break down. All that stuff you said is basically what happens. The shared sentence is new to this game, and only applies in a corrupt, backwards, theocratic foreign country you visit. Its on the brink of revolution and has basically no lawyers left at the start of the story (like you said). They laid the lawyer hate on way too thick. I'm really sick of half the conversations being about killing me and reminding me I die for every decision I make. Just way too much it gets annoying and I have to start skipping text because I wanna hurry up and prove all the idiots wrong.